Household order aside, this is not what you want to be saying on the day after the Resurrection. Christ wasn’t raised from the dead so we could pack him away with the good china and Easter baskets until next year. Easter is about our resurrection life, too. In Surprised by Hope, N.T. Wright says that if Lent is when we weed the garden, Easter is when we plant and nurture. We are invited to participate in the new creation that came into being on Easter Sunday. In the first creation God’s words manifested in visible, tangible things — stars, oceans, plants, animals, people. The creation that took place on that first Easter was largely invisible, though no less miraculous. What was created when Jesus emerged from his garden tomb was the hope that death was not the end. What came to being was the promise that the Holy Spirit would animate and give us power to live new and different lives, just as He did for the Apostles. Where once they were fearful, now they were bold. Once they were the students, they were now the teachers. They were now the healers, forgivers and welcomers to sinners. This was their resurrection life and it can be ours, too. It’s Resurrection Monday. The world outside my window looks the same as it did last week. The news on CNN is, lamentably, more of the same. But In the spiritual realm, everything is new. 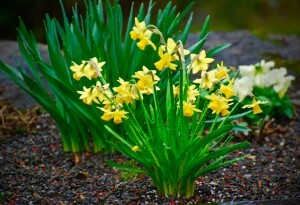 God is calling me to join Him in His new creation, to take the daffodils from my Easter dinner table and plant them in the garden. He is inviting me to live and love in this world, to create beauty and do good, knowing that there is an unseen reality where love and justice reign, and where death is never the end. It’s Resurrection Monday. What will you plant?